Stronger U Strength & Nutrition Coaching | Eat, Train, Thrive! Are you ready to get off the diet roller coaster, end the negative self-talk, feel STRONG and Empowered, look and feel amazing, and live a healthy and fabulous lifestyle with ease? never going on a deprivation diet again! no white knuckling – will power, like muscle, fatigues after awhile. no brain fog – hello elephant-like memory! Then STRONGER YOU Coaching was created for you! This is exactly why I created the STRONGER YOU Coaching. STRONGER YOU Coaching is a 16 Week 1:1 Training and Nutrition program designed to help you lose fat and build muscle in a SANE, SIMPLE, and SUSTAINABLE (FOREVER) way. Yes, I am ready to Invest in my Health & Strength! Apply Here! The STRONGER YOU solution is for the woman who is tired of dieting. Tired of being told what she can and cannot eat. For the women who wants to get STRONG, lose fat and feel confident in her skin, without using extreme measures and short-term crash diets. Tired of feeling guilty for eating the foods that you enjoy. Tired of the losing and gaining the same weight over and over. Hi, my name is Candace, and I am a Personal Trainer, Fat Loss Coach, and Diet Recovery, Strategist. I help women get strong, quit all the Diets, and learn how to love themselves from the inside out. Being fit, strong, and ending the diet cycle is so empowering and freeing! I have been coaching women like yourself for over ten years now. Women who were fed up with the yo-yo dieting, the endless cardio regimes, and the guilt surrounding food. If you’ve tried every diet under the sun and found yourself stuck and discouraged – it’s not your fault! I’ve done them too. I feel ya, I’ve tried them all, in one way or another. The 1200 calorie diet comes to mind – endless cardio and eating 1200 calories – Starving Like Marvin! I was miserable; I was hungry. Let’s be honest, I was hangry. I did lose some weight and then gained it all back, plus some. Sounds familiar, right? What if I told you there is seriously a better way? The fitness industry is crowded with quick fixes and gimmicky solutions that will make you lose weight for a short period of time…but that weight will always come back if the weight loss was rapid or the methods extreme. This happens every single time. I don’t do fast or extreme – I want you to achieve the best version of yourself with safe, sane, and sustainable methods. None of these quick weight loss plans offer sane methods; they only result in nasty rebounds. If you want a lifestyle change, not a crash diet, and want to THRIVE through your fat loss goals, then you are in the right place. Book A Discovery Call and Let’s Decide Together. What to expect during the 16 weeks? How to STOP Dieting – to end the “restrict — deprive — binge” cycle. You can still change your body while eating the foods that you love. You will gain more energy and more confidence through learning what works for YOU! Better body composition – You can expect to see your body change and your clothes fit better. You can look forward to inches lost! To view food as food, and that food holds no moral value. There are NO banned foods or “Eat This Only” lists! To go from deprivation to moderation, with education on how to do so! I will be teaching you how to eat for nourishment, and how to eat for enjoyment. Nourishment and enjoyment go hand in hand, that’s what Moderation is all about! How to Lift the things! The tone that you wish to see will come from strength training. The importance of having muscle, and it what does for the female body! Who is STRONGER YOU For? Women who are frustrated and discouraged because nothing is working. You’ve tried everything, and have not seen the results you wish to see. Women who have had it with the diets, quick fixes, and extremes that aren’t sustainable. Women who are ready to end the all or nothing approach. Women who are ready to take their health back. Women who aren’t afraid to lift weights, and are willing to put in the work that it takes to see progress. Who is STRONGER YOU Not For? Women who are solely focused on weight loss and the scale. Women looking for a 21-day quick fix. Women looking for a meal plan. Women who are afraid to lift weights because they think it will make them bulky. Women who aren’t ready to make a lifestyle change. Women who are not willing to try something a new. I will show you a better way to achieving your goals. 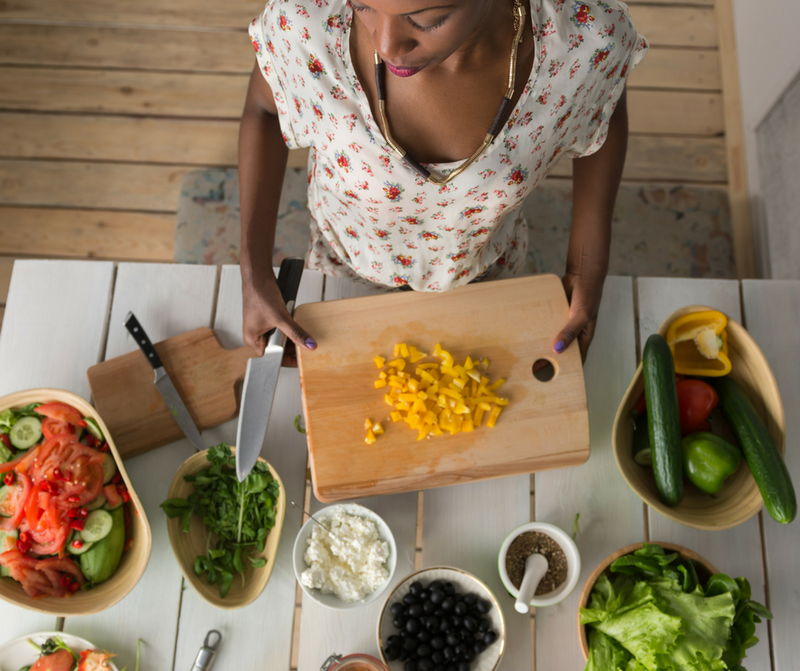 Women who are not ready to break the diet cycle. Women who are not willing to do the work. I put a lot of time and effort into every one of my clients. I can’t want this more than you do. You must be 100% committed! Please only apply to STRONGER YOU Coaching if you will be 100% committed to the process, enhancing your lifestyle, and quitting the diet roller coaster once and for all. I only work with women who are ambitious and don’t have 101 excuses. You must be ready to do the work. If you are serious click that button, if not I will be here when you are really ready to take Action! Everything you need to ensure your success! Your plan will be customized to fit your goals, preferences, and lifestyle. You will have full access to me for support, accountability, and motivation. Bi – Weekly Phone Calls/Skype or Facetime Check-ins to ensure your success and to track your progress. Any of your questions or concerns will always be addressed. I am 100% in your corner! Form checks on exercises as they arise: Have questions on form for an exercise, I got you! Customized Nutrition Programming based on your unique needs. We will build a program that will enhance your life, not hinder it. Customized Training Programs based on your schedule, equipment availability, and time – updated every 4 – 6 weeks. Cardio Protocols: Not endless cardio, just the right dose! Text and Email Access: Monday – Friday: Got a quick question, you can just text me and we will figure out the best course of action together! Weekly email check-ins that will help you stay committed and feel encouraged along your journey. New habit formation: You will work on one habit at a time, in two-week increments. Everything will be broken down into bite-size chunks. Mindset work to ensure your success to health and nutrition. We have to get our minds right for all this to stick, to release food obsession, and finally achieve food freedom! Vested interest in your success. I’m 100% in your corner every step of the way! A team player – Teamwork makes the Dream Work! Support, Accountability, and Motivation – I’ll coach you through any hurdles or obstacles as they arise! What My Clients have said! 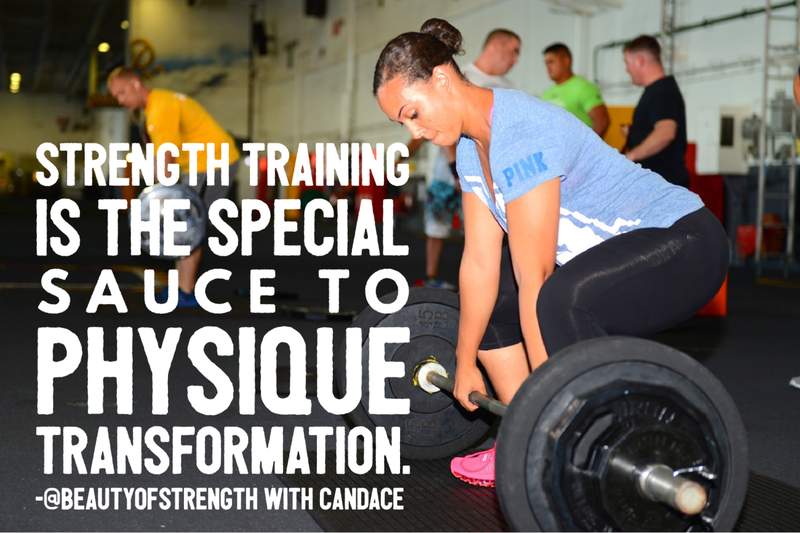 “If you’re tired and hungry, I suggest you give Beauty of Strength with Candace a chance! She’ll have you feeling strong and satisfied (with food, yourself and your lifestyle) in no time! Her ability to personalize and adjust workouts based on your strengths and weaknesses helps make you successful and takes the scary out of strength training. She’ll help you focus on what you should add to your meals, vs take away, which takes the pressure and stress of eating away. You can enjoy meals again! Instead of spending my time counting points, feeling guilty & honestly- having an unhealthy relationship with food & exercise- I now spend my time engaging in fitness activities I have the energy for, and like!- because the focus is less about losing weight and more about getting stronger. With that shift in mindset comes functional strength, emotional strength, confidence & self-love! Instead of suffering to lose the same 10 pounds over and over, I’m thriving! I haven’t lost much weight but I have lost impressive inches and more importantly, I’ve gained comfort & confidence in my own skin. After years of yo-yo dieting and on again, off again exercise- I’ve established healthy sustainable habits in only three months of working with Beauty of Strength with Candace. With her support, I’m improving everything from my push-ups, deadlifts, squats, and hip thrusts to my ability to lift baskets of laundry, bags of groceries and small children. My swimming, kayaking, and jogging has also improved!- but I think the mindset shift has been the biggest and best change. With her modeling and coaching, I’ve shifted from extreme to consistent and from guilt to grace. “Candace is an amazing trainer because I feel that she approaches diet and fitness the RIGHT way. She never let me starve myself and encouraged me to enjoy the foods I liked in moderation. With patience and consistent workouts, I started to see results. The results I have received from training with her have been results that last! This is coming from a chick that has tried multiple ways to lose weight (Insanity, CrossFit, etc.). She creates workouts for me that are consistent, so I don’t have to think when I enter the gym. This way I can see myself progress over time. She would incorporate fun short cardio tidbits to ensure that I got my heart racing but not dreading it at the same time. I highly encourage anyone to hire her as a fitness coach. Her style of training is a definitely a lifestyle, not a fad.” Pevee C.
“I had a wonderful, challenging yet enjoyable experience training with Candace and I would and will be hiring her to train me again soon! I love her attitude and how she inspired me to push myself. I gained muscle strength and tone that helped me have less back and body musculoskeletal pain. 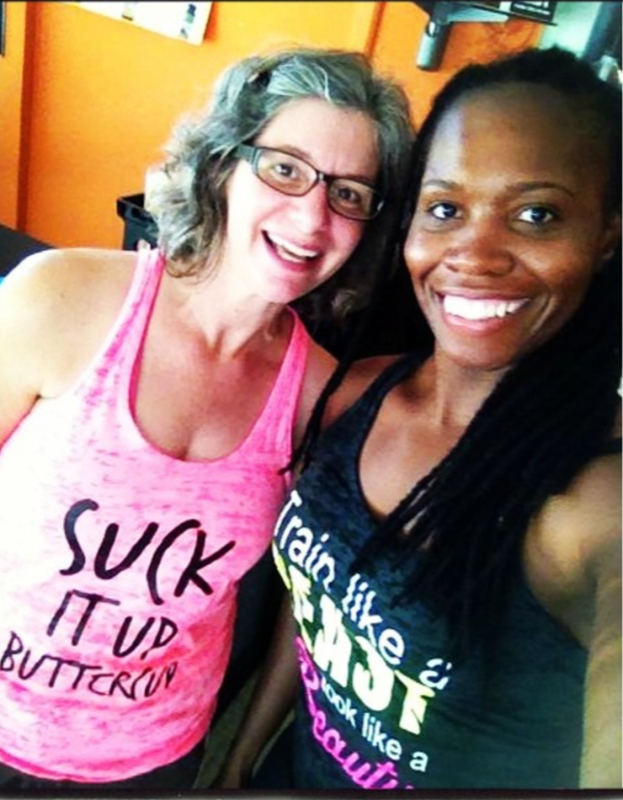 Candace is one of the best trainers in the region!” Erin H.
“Candace was just what I needed! I am a 43-year-old woman who has always tried to stay fit. However, my workouts had ceased to make the difference I wanted to see. I was spending 30 minutes to an hour on an elliptical but was seeing no results. 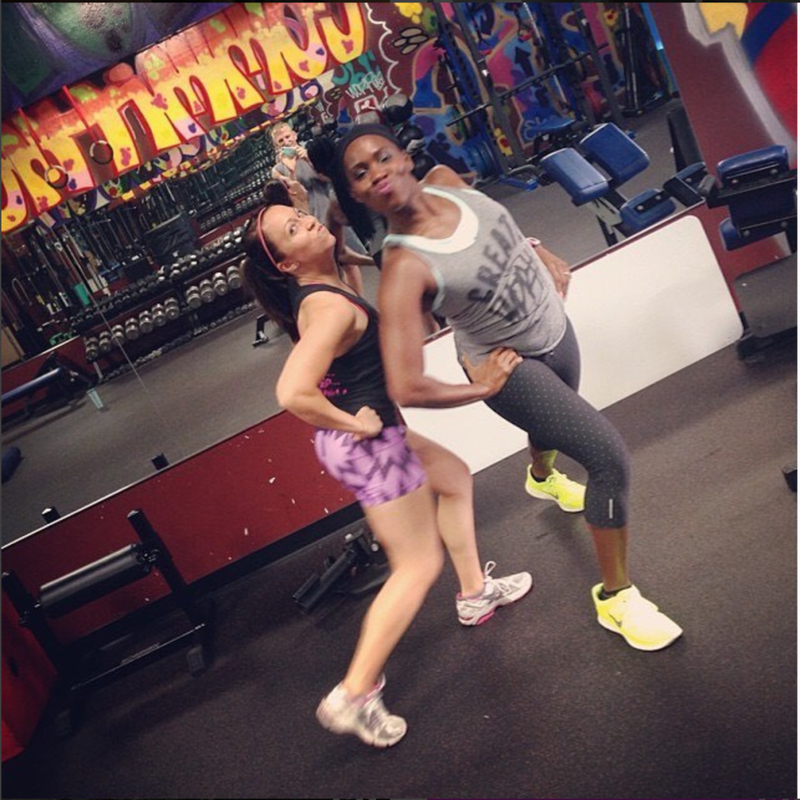 Candace worked with me to customize a fitness plan that condensed my workouts and optimized my time. I ended up spending less time in the gym and seeing significant changes in my body. Instead of shooting for “skinny!” Thanks, Candace!!! !” Samantha S.
“I was 51 years old when I began training with Candace. I was actively exercising when we began but was starting to have knee pain. I was also motivated to learn how to do push-ups. My goals, therefore, were for her to check my form and to learn a new skill. I had never had personal training before and, quite honestly, was a little intimidated initially. Candace is affirming and encouraging in her approach. She sets reasonable goals and would never allow me to be unreasonable with myself. She kept our workouts interesting, fun, and challenging…always pushing me to try something new or just have fun with what we were doing. She was skilled at injury recovery and knew when to adapt when I just wasn’t feeling it. 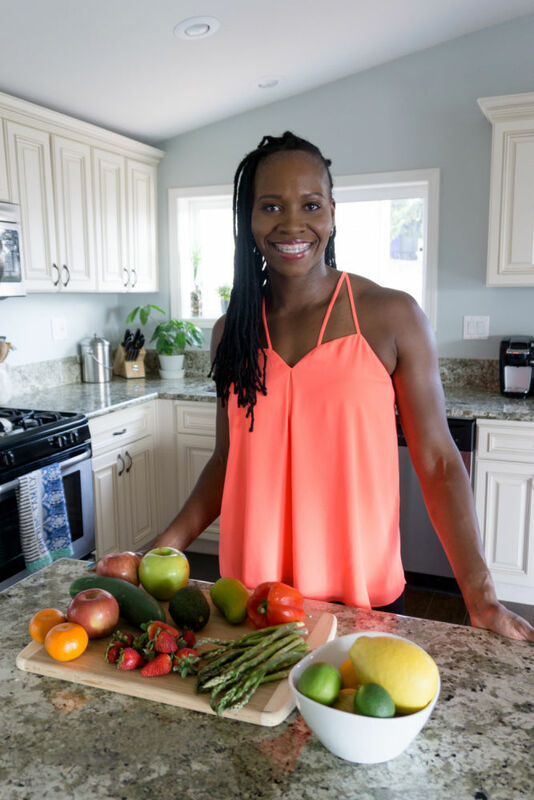 My biggest surprise in working with Candace is the amount of information I learned about the role of nutrition in strength and overall health. Candace was always responsive between sessions. She stays on top of research and industry trends, so her responses are educated and informed. My initial thought was that I would meet with Candace for six sessions…that turned into two years because her role became invaluable to my progress! I am stronger, more confident, and generally more healthy today as a result of Candace’s expertise. I would highly recommend her!” Karen C.
Will I have to purchase additional supplements? No – possibly a protein powder of your choosing. A protein powder supplement may be ideal for you if you have trouble getting enough protein in for the day. Is this a meal plan or macros coaching? Sorry, no cookie cutter meal plans will be given out. I am not a one size fits all Nutrition Coach. However, we will build a plan as a team; everything will be customized to meet your needs. As for Macros (Protein, Carbs, and Fats), we can discuss what that should look like. Each person is unique and different, and will require different nutrition protocols. No, workouts will be customized to what you have available. If you have a gym membership, that’s great too. If your workouts are home based, I may recommend a few select pieces of equipment to help you have effective workouts. A couple pair of dumbbells would be great, to begin with. Yes, this a 16-week/4 month commitment. If you cannot commit to 16 weeks, this program may not be for you. You will be sent a welcome email with the next steps to get started with your Nutrition and Fitness Protocol. I am a beginner, and I have never lifted weights. Is this program for me? It depends, everyone is different. I would like to hear more about your exercise history. Let’s hop on an Anti-Diet Chemistry Call. Don’t hesitate, sign-up now for Stronger YOU NOW! Take control of your food, fitness, life, and health today. I’m ready to help you get STRONGER, look better, feel better, and move better. So, what are you waiting for?